Running Coach Melbourne is a professional running coaching service. RCM offers speciality training for clients of any ability. Our coaches are registered with Athletics Australia and have several years' background in top level athletics as well as other sports such as AFL football. RCM specialises in fitness, developing correct running technique, weight loss strategies and training to compete at a professional level. Mark Howard, 39, has been involved in athletics for over 20 years as an athlete, coach and CEO of the Victorian Athletic League. Mark is accredited with Athletics Australia as a Level 3 coach. Mark is the original proprietor and creator of Running Coach Melbourne. Mark has assisted people as young as 7 to 60 years of age and is willing to assist any person of any athletic ability. Mark believes that having the correct running technique is the most essential tool to gaining speed and running long distances such as the Marathon. Mark is a member of the Doncaster Athletics Club and coaches runners at this track. He coaches a group of runners from 6pm from Monday to Thursday and holds weekend sessions from 9am. Mark encourages athletes of any ability to join his group, whether a novice or an elite runner Mark can tailor a training plan to suit your requirements. He can also assist with an online training program for runners who cannot attend his sessions. Mark has a background in AFL having played over 150 games in the Essendon District Football League. He has trained and assisted Calder Cannons players, Eastern Rangers TAC cup players and has assisted players to get drafted to the AFL. 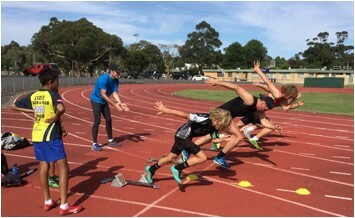 From an athletics perspective Mark has trained elite runners of all age including Victorian state championship runners, Australian national junior representatives as well training professional runners to win at the Stawell Gift carnival. Some of Mark's recent notable performers include Hamish Adams (Stawell 120m Junior winner), Ewan Webber (Victorian State Championships qualifier), Rob Adin (400m at Stawell in 45.83secs), Sebastian Vetich (100m Victorian State Champion 2016), Eve Parry (2016 Australian National qualifier 200m & 400m). Mark's professional achievements in the Victorian Athletic League include winning the 3 major 400m professional events, including the Bendigo Black Opal (46.24 sec), the richest professional 400m event in Australia. Mark has recently returned to competing after a long period off and recently ran an 8km race in 32.34sec and completed the 2012 Melbourne Marathon in 3hrs 58mins. Mark is also the owner of a sporting consultancy service www.sportconsultantsaustralia.com. To book an appointment with Mark, email runningcoachmelbourne@hotmail.com or phone 0402 199 463. Emma Gaul, 42, is a qualified personal trainer and run coach and has been training with Mark for over four years. She has a wealth of personal experience having competed in a variety of sports including triathlon and middle distance running and now focusses on sprinting and strength training. Emma is a true motivator and passionate coach specialising in junior athlete development for those playing field sports such as Aussie Rules, Soccer as well as athletics. Emma works with individuals and groups to improve performance by developing technique, strength, speed and mobility. Emma also works with individuals seeking to improve their general fitness or improve their performance for running or other sports. Sessions are structured to the needs of the individual and may focus on running technique or strength and conditioning. Eric Sapac is an accredited coach with Athletics Australia. He has a passion for coaching athletes of all abilities. From the fun runner to the serious competitor, Eric believes that all athletes should have a goal to work towards. Whether it be completing a 6km fun run, running a Marathon or improving your 100 metre PB. Along with coaching, he competes in the Victorian Athletic League in multiple distances ranging from 70m-1600m. Over the winter months, he runs in Cross Country events ranging from 5km -16km. Eric has experienced much success over the last few years winning races ranging from 300 metres ranging all the way to 8km. The range of distances he competes in provides him with a wealth of knowledge in regards to the training methods required for each event. Also, with a rich background in Soccer and Aussie Rules Football, he has developed a thorough understanding of how to improve the athlete’s speed, agility and conditioning in order for them to perform at a higher level. To book an appointment with Eric, email runningcoachmelbourne01@hotmail.com or phone 0422 063 845. Rob Adin, 37, is a former age grade representative and senior club rugby player in New Zealand as well as a premier level rower and university rowing coach. Rob's interest in athletics began following a serious mountain biking accident. Rob has now been involved in athletics for several years training with some elite coaches and runners based in Melbourne. Rob has competed with Athletics Victoria in the cross country series, Run Melbourne, completed the Melbourne Marathon half marathon and has run some professional races with the Victorian Athletic League with his best result winning the 400m Open at the Stawell Gift 2015 carnival. Rob has also competed in mountain bike and road cycling events, triathlons, tough mudder and ocean swim events. Rob now has developed a keen interest in coaching athletes of all levels and assisting them to achieve their goals. Rob has a focus on general fitness, correct running technique, stretching and encourages athletes to undertake pilates as part of their training. Rob is based in the CBD area of Melbourne and can assist any runners who are seeking training sessions in the city area. Matt Shiel decided to compete in Athletics in 2007 to get fit for pre-season football. Matt's notable performances have been making the finals at 400m Bendigo Black Opal classic, Stawell Backmarkers, Frontmarkers and Novice. He also won the Ringwood novice 400m. Before devoting time to athletics he had placed and won fun runs and triathlons in his age group. Matt also played American Football for college teams Auburn Tigers, Alabama and Mercer Bears, Georgia in the United States. He was first team All So-Con Punter and named on the College Football Award List. Whilst in the U.S he was able to learn from elite Strength and Conditioning coaches. Predominately from a background in Aussie Rules Football where he has played and coached at representative/TAC cup level he will be able to set up programs to enable you to play at a higher standard. With an interest in training programming and methods he is committed to fulfilling every athlete's goals to improve their technique, speed, power and endurance. Pete Boardman, 48, is a keen fitness person who is based in the western suburbs of Melbourne. He has been coaching under the guidance of Mark Howard for a number of years and is a registered Athletics Australia coach. He has personal experience having competed in a variety of sports including sprint and middle distance running as well as cross fit competitions and martial arts, he has a focus on strength training as well as teaching all his clients proper running technique and drills. Pete is a passionate coach specialising in junior athlete development and distance running for athletes of all sports. Peter works with individuals to improve performance by developing technique, strength, speed and mobility. Sessions are structured to the needs of the individual and may focus on running technique, strength and conditioning. To book an appointment with Pete, email pete.boardman45@gmail.com or phone 0409 551 216.